This month, Mike Tate our UK Norseman winner started his training with blueseventy coaching partner Andy Bullock. The first session was a video swim analysis at the University of Bristol and enabled Andy to give Mike essential feedback on his technique to help him become more efficient over the 2.4mile swim. In the first of his training blogs, Mike talks us through his thoughts on winning and starting training towards that famous black tshirt. You can read Mikes blog over on our main blueseventy site as we're in the process of closing down this blog. It’s exciting times in our world of swimming at the moment. Not only is it 80 days today until the FINA World Championships in Barcelona, but we’re getting ready to launch some cool new swimwear this summer. neroTX is now available in FINA approved colours – pink, blue and orange! You’ll be able to order those from June 2013 but we’ve had a few swimmers wearing the first samples at the Australian Swim Trials in Adelaide this week, there are a few about to break into the water for the first time in the UK next month and some heading to the US Masters in Indianapolis. We’ve also refitted neroXII to make it even faster. Look out for nero14 this summer. So with a bigger range of suits now available, we’ve put together this guide to race suits – which to chose, how put it on correctly, how to care for it. These tips are designed to help keep your suit swimming faster for longer, so we hope you find them helpful! Which nero for which competition? Always have a spare suit with you, just in case! And you may need a dry suit for finals anyway! If you have two races that are very close together, keep the suit on but remember this isn’t ideal, and might stretch your suit. Girls, if you swim down between races wear a training suit over the top of your race suit, take the straps off your shoulders and roll the race suit down to the narrowest part of your waist. This will be more comfortable, and it will help to reduce the stress on the bonding and fabric. neroXII and nero14 are ideal for that one off race when you need to be at your absolute best! If it takes you less than 5 minutes to get into your suit, you are not wearing the right size. Race suits need to be worn very tight, like a second skin. If you wear the right size, it will also be virtually impossible to get into if the suit is wet, so make sure you dry your suit thoroughly between wears, but definitely not under a hand dryer! Take your time, work the suit up slowly from the bottom, pulling on the seams or double layered panels where possible, and don’t forget to cut your nails! Girls may find it helpful to have a friend to help them get the straps onto their shoulders. We know at the end of a competition you are completely exhausted, and rinsing out your suit doesn’t seem like a priority... but leaving your un-rinsed nero at the bottom of your swim bag will damage it. To keep your suit faster for longer, please take the suit off after your race and rinse it in cold water before it dries. The next best way to dry your nero is hung upside down from the legs – this will prevent water gathering at the crutch and damaging the bonding in this area. Do not use a hand dryer to dry your suit between races, ever, please! With this simple guide, blueseventy hope to keep you swimming faster for longer! At the ITU WTS San Diego event last weekend bluseventy athlete Gwen Jorgensen won and American National Championship but even bigger than that she became the first American female triathlete to win a WTS event. Great Britain's Non Stanford, debuting in WTS events, charged hard late in the run to grab second place by a meter over Emma Moffat - putting blueseventy athletes on the top 2 steps of the podium. San Diego was warm but cool water made it a wetsuit swim so both ladies donned their helix wetsuits to start the race. bs: Gwen, first congratulations on your historic win, how were you feeling going into WTS San Diego? Gwen: I was feeling good; I knew my last three months of training had gone well and I was excited for the opportunity to race on home soil. bs: You are a massively talented runner by background- what do you do to keep your swimming sharp so you can keep yourself in the "game" in the highly competitive ITU format? Gwen: I am coached by Jamie Turner, who has me focusing on my swim. We have been taking my swimming back to the basics, focusing on technique and drills to help with my open water swimming. I also swim in the ocean with my Helix wetsuit at least once a week to prep for races. bs: What do you like most/what is most helpful about your Helix wetsuit? Gwen: I love my Helix wetsuit. It does all of the obvious things like keep me warm, but it's comfort, durability, and ease in removal are key. I love the zipper that starts at the top (reverse zipper), it makes getting the wetsuit off faster than others. I swim in my wetsuit multiple times a week, and I love the durability. The Helix also gives me a lot of mobility in the shoulders, making it easy to swim faster with a high cadence. Last week swimmers from across the UK, Europe, the USA and UAE travelled to Leeds for the first British International Swim Meet. The meet was highly anticipated and featured an impressive line up of athletes, including triple Olympic gold medallist Natalie Coughlin, and current Olympic champions Ruta Meilutyte of Lithuania and Ranomi Kromowidjojo of the Netherlands. Between them blueseventy swimmers, known as ‘teamblueseventy’, reached the podium nine times winning four gold, three silver and two bronze medals. Derventio eXcel (who recently renewed a swimwear deal with blueseventy) swimmer Abbie Wood also met the qualifying criteria to compete for GB at the European Youth Olympics. James Guy, the youngest member of teamblueseventy, had an outstanding meet, winning the 200 freestyle (1:48.28) and 800 freestyle (8:04.38). At just 18-years-old James was young enough to swim in the junior final but chose to race in the senior finals. In the 200 freestyle he beat two-time Olympian and 2010 Commonwealth Games champion over that distance, Robbie Renwick, while in the 800 freestyle he beat Britain’s Daniel Fogg, who finished 5th in the Open Water 10km at London 2012. But James didn’t stop there. He also won silver in the 400 freestyle only losing out narrowly to Robbie Renwick, and bronze in the 200 butterfly. Georgia Davies, who represented Team GB at London 2012, produced some fast early season times to become double champion in the 50 backstroke (28.04) and 100 backstroke (1:00.45). It was a narrow victory for Georgia in the 100, with only 0.06 separating her and silver medallist Lauren Quigley. 2010 Commonwealth Games competitor Alys Thomas swam two lifetime best times to win a silver medal in the 100 butterfly (59.62) and a bronze in the 200 butterfly (2:11.63). She was only denied gold in the 100m by three time Olympian Jeanette Ottesen Gray from Denmark, who finished 6th in 100 butterfly at London 2012. Adam Barrett also won silver in the 50 butterfly in a blanket finish, with just 0.13 separating second and fifth place. Barrett touched ahead of British Champion Jack Marriott, and Olympians Anthony James and Michael Rock. Congratulations to all the athletes who were swimming fast in nero! blueseventy is delighted to announce that we’re supporting reigning Ironman World Champion, Pete Jacobs as he prepares for a tough season of racing before targeting the defense of his title in Hawaii in October. Jacobs has a signed a multi-year deal. 2011 and improving on that performance with a convincing victory last year. At just 31 he could dominate in Kona for years to come. “I'm very happy to be back in the best fitting wetsuit I've ever worn,” Jacobs commented. Tim Moxey, blueseventy's CEO is pleased to have Jacobs back. "Pete's one of the best swimmers in the world and chose blueseventy as his first ever suit when he was coming up through the ranks in Australia. Knowing how important the fit of the suit is for him, we knew the current helix would lure him back. It's the fastest suit on the market." blueseventy's Director of Athlete Support, Ryan Vanderloop, has setup Pete with the new suits to help get him ready to race the Escape from Alcatraz Triathlon in San Francisco this weekend. "We have some new products we're developing for Pete, and he's helping us with some tweaks to some of our suits for next year." Participation in long distance triathlon is growing at a phenomenal rate around the world, and blueseventy is proud to be working with the two best long course athletes in the world with Jacobs and Leanda Cave, the defending Ironman and 70.3 World Champion. In 2013, Jacobs will race the Escape from Alcatraz Triathlon, Utah 70.3, Hawaii 70.3, Cairns 70.3, Ironman Frankfurt and Philippines 70.3 with the ultimate goal of repeating his victory at the Ironman World Championships in October. We will be supporting him all the way! Four up and coming junior triathletes, all supported by blueseventy, made the long trip from snowy Britain to boiling hot Sydney for the Australian Youth Olympics (16-20 Jan) and came away with three bronze medals. Young sensation Georgia Taylor Brown, the European Junior champion, and Scotland’s Marc Austin won bronze medals for Team GB on Sydney’s hottest day since 1939. The Youth Olympics features 1700 athletes taking part in seventeen sports over five days and aims to develop Olympians of the future. For the southern hemisphere athletes the event takes place mid-summer, but for those from the north it was a tough challenge to race in the middle of winter training. Australian triathletes claimed gold in both the men’s and women’s races through Jacob Birtwhistle and Jaz Hedgeland, but Marc, who is 18 and a Maths student at Stirling University, was delighted with his bronze medal. A day on from the individual success, Marc and Georgia teamed up with Sophie Coldwell and Gordon Benson to win bronze behind two strong Australian teams in the mixed relay – a fantastic and exciting event that could feature in the Rio 2016 Olympic Games if the IOC vote goes the right way in September! British international open water swimmer Tom Sunter, 20, chats with blueseventy about his transition from the pool to the deep blue and the 2013 Open Water swim circuit. I’ve been a swimmer from a very young age, but I only competed in my first open water event in 2010. The last past two years have seen me gain a lot of experience in what was an ‘alien’ sport to me! I made the British team for the 2010 LEN Cup in Israel (which also doubled as the World trials), despite never having swum more than a 1500m in the pool! So what have you been up to more recently? I swam at the 2012 European Open Water Championships in Italy, where I was hoping for a top ten finish on the 10k. I was a bit unlucky and was out of the water for a month before. I only got back in just three weeks before the competition, so I knew it was going to be tough. I started well and to the 7000m mark I was sitting in around eighth place. But then the lack of training and preparation caused me to slip down the pack and finish in 27th... Not what I had hoped for! I’d finished 5th at the Junior Europeans for the previous two years, but this was my first European Championships as a senior. But you have to look at the positives and I did take a lot of experience from that race. What does the 2013 hold for you then? In January I am competing in the first two legs of the World Cup Series in Brazil and Argentina and I’ll be taking my blueseventy nero legskins with me. This will be the first time I compete in a FINA World Cup event, even though I’ve competed in five legs of the European Cup over the past two years. I’m looking forward to visiting Brazil, especially with the build up to the 2016 Rio Olympic Games just beginning. What would you like to achieve in 2013? My main aim is to qualify for the World Championships in Barcelona in July. If I manage to secure a place on the team for that, then that is just a bonus, as I know how difficult this is going to be. Who are you up against this year? My main rival for a place on the team is Daniel Fogg. Dan finished 5th in the 10km at the 2012 Olympic Games. I’ve raced him a few times over the last two years on 10km events and I know how tough he is. Seeing as you’re from a pool background, how have you found the transition to open water? It wasn’t as hard as I expected. My stroke is suited to racing in rough and choppy water, and I’m able to ’spot’(lift my head up forward to breathe) quite easily. The thing I wasn’t used to during my first few races was just how physical a 10km race is! So many swimmers swim in such a small area that competitors receive knocks to the face and body. Obviously there is a referee to stop physical contact, but I have been hit a few times and I know that it was done intentionally! So apart from taking self-defence classes, what are your tips for someone looking to make the move to open water? Making the move from pool swimming into open water swimming is very exciting, but I would advise starting on a small/local race. That way you can work on techniques and skills, and then it will be easier to build up towards the bigger races, which are undoubtedly going to have more contact and be more challenging. Another tip I have is to draft behind other swimmers. Drafting behind other swimmers means a decrease in effort but still being able to maintain speed. It is estimated that a swimmer who has their head on the hip of another swimmer is exerting around 13% less effort that the swimmer in front. This means you can save energy for the sprint finish at the end. I once led a race for 9400m only to be overtaken on the final sprint... Had I drafted more, the results might have been different. What suits do you where when you race in the pool and open water? I’ve raced in blueseventy suits before in the pool, last season for example I wore the neroXII jammers and I was pleased with how they felt. Some suits often don’t fit as well around the knee but the Nero was great. I have also raced in the Helix wetsuit in one of the Great Swims in 2011. It was the first time I raced in a wetsuit and I found it surprisingly light and the freedom of movement I had was amazing! Good luck to Tom in 2013 as he takes on the world; we hope he’ll be swimming faster in blueseventy too! There are races that push your limits...and then there's the Norseman. Without question it's the world’s most iconic and toughest long-distance triathlon as well as the most Northern, taking place at the same latitude as Anchorage in Alaska and traveling through the most beautiful parts of Norway. The prize? Bragging rights for finishing on the plateau of mountain Gaustatoppen at 1,850 meters above sea level (that's about 6,000 ft for our American friends). Competition for the 250 slots is, as always, fierce and all have been taken for 2013. Except for the 2 that we have in this competition. As the official wetsuit and swimwear support, blueseventy is offering the chance to race Norseman 2013 along with a package that includes a blueseventy wetsuit, a race kit, race support and hotel accommodation. You'll also receive a training program with one of our coaching partners, Matt Dixon of Purple Patch in the US or Andy Bullock and Simon Ward in the UK. The winner will also be featured in the run up to the race by Triathlete Magazine or Triathlete Europe with regular training updates and a special race report. You will be walking people through your training progress and so you need to be comfortable writing updates posting up images. The competition is open to readers in North America and Europe - one race slot has been allocated for each region. Entries are now open and close on Sun 3 March. On Mon 4 March finalists will be posted live on our Facebook page. Votes are then open from any of our Facebook friends to vote for who they would like to see sponsored. The athletes with the most votes will be notified on Mon 18 March. It goes without saying that this isn't a first timers race and is generally suited to mad people who like beasting themselves in ice-cold water then running up a cliff face. As a minimum you need to have completed at least a handful of iron distance race to enter the competition. Race date is Sat 3 Aug...good luck! What's Norseman you say? Take a peak at the excellent video below and hurry over to our Facebook page to enter now! We're packing our bags and heading to Austin, TX next week for The Running Event, the nation’s premier conference for running specialty retailers. It's a show we all enjoy because of it's relaxed feel and the wide range of both retailers and vendors who attend. If your heading to the show please stop by our booth (#1368) on Tuesday, Wednesday or Thursday to see the latest in triathlon wetsuits, apparel, swim wear and accessories. While in town we'll also be holding demos of our Helix wetsuit at the iconic Barton Springs pool in conjunction with Jack & Adams, one of the premier multisport specialty retailers. We're getting up early for these and will be at the pool from 6:30 to 7:30 so if you're heading to this show we'd love it if you joined us for a swim. Anyone in Austin your more then welcome to come as well. Recently retired swimmer Rebecca takes a look at blueseventy’s British future pool stars for Rio 2016 after a controversial BBC article questioned the potential of British swimmers to better the medal total of London 2012. Swimmers across the UK were left defending their sport yesterday after a questioning article was posted online by the BBC. The article titled 'Can British Swimming rise again after the failure of London 2012?' discussed how Team GB "flopped in the Olympic pool" after winning just three medals - that's more than at Barcelona, Sydney, Athens and Beijing. Somebody should redefine failure! David Bond, the BBC Sports Editor who wrote the article argues that Britain's young swimmers do have the potential to outperform their 2012 counterparts in Rio 2016. In fact, blueseventy is already seeing many of the its up and coming swimmers stepping up and filling the vacuum left by those swimmers retiring after the 2012 Olympics. Among the swimmers in the blueseventy talent pool is sixteen-year-old James Guy from Millfield School. Guy, who will be 20 in 2016, won a bronze medal at the Junior European Championships in July and has recently improved his personal best times. He is now ranked third in the UK for 200m and 400m freestyle (SC) just behind two Olympians, including Robbie Renwick who is more than seven years his senior. Guy looks on track to reach Rio in 2016 and this weekend goes to Brazil to swim for GBR at the School Games. “Competing in Brazil will be great experience, there’s been such a buzz after the Olympics it’s made me realise how much I want to be at Rio 2016. Over the next few years I want to win European Juniors and medal at the World Youths, and hopefully make the Commonwealth Games team. It’s hard work, but achieving goals makes it all worthwhile, and the support from blueseventy is going to help me do that," said Guy. The BBC article also discussed how the 'home advantage may have become home disadvantage' despite being the biggest participation sport in the UK, swimming is virtually ignored by the media except for that one month every four years when British swimmers become dazzled by the flash flood of fame. As well as providing its swimmers with material support in the form of kit, blueseventy hopes the promotional work with our athletes will give them valuable media experience over the next few years that will help them deal with the pressure that swimmer Rebecca Adlington said she struggled with in London and Beijing. Adam Barrett was talent spotted by blueseventy in September and has already come along leaps and bounds. It seems the laid back butterfly wonder from Loughborough University won’t be shaken by the media in Glasgow 2014. “I'm a very relaxed person; I don't tend to let a lot of stuff bother me, which is ideal when an important race is coming up. Nerves aren't really an issue, I just tend to look forward to it more than anything," he said. Is this the attitude that the media expect from all our swimmers? If so, they should know Barrett is a rare breed in the pool and this could be his secret weapon over the next few years. His incredible work ethic and relaxed attitude has just won him a place on the British team for the Flanders Swimming Cup next year, and already this year Barrett has won two titles at the British University and College Championships (BUCS) and won titles at the Masters National Championships, breaking British records in the process. @Ge0rgiaDavies90 (Geogia Davies), @Adam Barrett92 (Adam Barrett), @jimbob95goon (James Guy), @SwimRory (Rory Pardoe), @ross1muir (Ross Muir), @alys_thomas (Alys Thomas). To find out what on earth all the fuss is about the BBC article, you can read it in full here: http://www.bbc.co.uk/sport/0/swimming/20400810. For more information on the FINA World Short Course Championships, visit: http://www.wscistanbul2012.com/. We’d love to have your feedback on this article, and what do you think the next generation of British swimmers are capable of at Rio 2016. Leave your comments below! “It's that time of the year again, the season’s over and it’s time to reflect on the past year. I had a relatively poor start to the year, I finished 5th in a European Cup and 14th at European Champs in Eilat. Whilst this isn’t horrendous, being the competitive person I am I had just expected better from myself. Feeling a little disappointed with my results at these events, I decided to go through some things with my physio and we put my performance at these events down to a sudden growth spurt. Thanks to him and the team, we worked on it and I was able to turn my season round. I also missed racing in May and June due to my exams, but we have to get our priorities straight and make some sacrifices, right... After exams, I went on to race here and there around Europe, and I was able to secure a win and a silver in the European Cups and 29th against an elite senior field in Paris, only really missing the Brownlee's. Most recently last weekend, I was in New Zealand to finish off at the World Champs. I went into it hoping for a medal but said I'd be disappointed if I didn't get top five. In the end I came away with 5th, so I can't complain too much but I'm never happy! Although having a 10th and a 5th at World Championships, we're going in the right direction for my last race as a junior at the home World Championship in London next year. In the swims this season I've just been getting myself into a high position round the first buoy and, providing I'm on good feet, I'm usually happy to sit on the leaders feet rather than on the front, saving energy but holding a high position. Marc Austin is very strong in the water, he races in a Helix as well and we normally use each other in the swims, having been out together in Portugal, Israel, Czech Republic on the swims. Congratulations to Gordon for this season, we’ll look forward to seeing you first out of the water soon! Guest writer Jesse Kropelnicki, Elite coach and Founder of QT2 Sytems discusses swimming for a traithlete's perspective. Triathletes typically have a significantly more difficult time becoming proficient competitive swimmers than their single-sport counterparts. First, and foremost, because triathletes must focus on three very different disciplines they simply do not have the time, on a day-to-day basis, to put in the necessary swim volumes that would promote adequate sport-specific efficiencies. As a result, triathletes must be extremely meticulous in how they develop mechanical efficiency in the water. Of triathlon’s three disciplines, swimming is the most dependent upon sport mechanics due to the significant difference in the resistance of water versus air. A compounding factor is the difficulty in gaining mechanical proficiency in the water, due to a lack of solid contact points on which to anchor the body. Cycling provides five contact points, and is therefore the easiest discipline for developing mechanical efficiency. Running, with only a single contact point, has its difficulties, but still does not provide the level of difficulty of swimming. Having no contact points, swimming allows many “degrees of freedom” for inefficient movement. So, the question becomes: How can we help our athletes focus their limited time and energy where it is most appropriate through specific swim test sets throughout the season? In the water, training for speed can really be broken down into two primary components, namely fitness and mechanics. Mechanics can be further broken down into balance/streamlining and propulsion. The first three test sets, below, focus on identifying an athlete’s mechanical limiters and will help to direct their early-season swim training. Later in the season, the final two swim sets will evaluate an athlete’s fitness, gage progress, and help to predict race performance. Swim Golf – This test set has been around for quite some time, and for good reason! 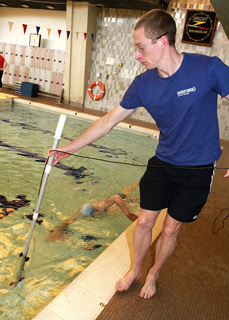 It evaluates streamlining, and is therefore a very good indicator of your athlete’s in-water balance. Using it during the early part of the season can help to guide the athlete’s next couple of months of training, and will not impact more race specific training. Swim Golf consists of a timed 50-yard swim, and its corresponding stroke count. The sum of the time, in seconds, that it takes the athlete to swim 50-yards, and the stroke count represents their total score. Athletes who are 5’6”, and taller, should aim for a score that is under 65, while shorter athletes should strive for a score that is below 70. Athletes who meet these thresholds are likely well streamlined, have good balance, and can move onto the propulsion-focused sets, below. Until then, the athlete will be best served by focusing on drills that continue to address in-water balance and streamlining. No Kick/Kick – Following a warm up of about 500 to 1,000 yards, the athlete should kick a 50-yard Time Trial, take a 1-minute rest, and then swim a 100-yard TT, without any kicking. If dividing the no kick TT time by the kick TT time, both in seconds, yields a score between 1.55 and 1.65, the athlete has reasonably good propulsion from both the kick and upper body. Having already “passed” Swim Golf, the athlete is known to have good in-water balance, and overall propulsion. Therefore, this test really determines the source of the athlete’s propulsion. A score below the acceptable range is likely indicative of an inefficient kick. Focusing on ankle flexibility, and having the kick originate from the athlete’s hips will help to bring the kick on par with the upper-body propulsion. Scores above the acceptable range may be a sign of an athlete who is unfit, has a lower BMI with limited strength, and/or lacks a high elbow and good arm position. It should be noted that an athlete’s overall propulsive progress can also be tracked using this set throughout the entire season using the sum of these two times as the metric. The above test sets are great ways to assess the effectiveness of an athlete’s early-season drill work, but neither of them are indicative of whether or not the athletes’ targeting drill work is leading to faster swimming. This next set is simple, but an excellent way to evaluate swimming efficiency during the early season. 150-yard TT – Following a warm up of about 500 to 1,000 yards, the athlete should swim a timed 150-yard TT. Repeating this, every two weeks during the early-season, is an excellent measure of mechanical progress. The length of this effort is perfect in the early-season, because it is not long enough for fitness to play a significant role, and not enough quantity to undermine a focus on aerobic base. Having addressed the two major pieces of the mechanics puzzle, the following set will evaluate the specific physiological needs of the athlete, as race season approaches and training becomes more intensive. Over/Under – Following a warm up of about 1,000 yards, the athlete should complete a timed 200-yard TT, followed by an 8 minute rest, and then a timed 1000-yard TT. The athlete’s total swim speed (fitness and mechanics) can be assessed by the addition of these two times. Because the 1000TT is so aerobic in nature; likely 70-80% aerobic energy production, versus the 200TT’s 20-30% aerobic energy production, this set is an excellent indicator of an athlete’s physiology and training needs. If the ratio of the 1000 time to the 200 time is greater than 5.4, the athlete either lacks aerobic fitness and durability, and/or is very anaerobic. A heavy dose of continuous aerobic swimming will help to further develop the athlete’s aerobic system and decrease this ratio if required for their race distance. A ratio that is below 5.4, indicates a very aerobic athlete who will benefit from training that is oriented towards shorter swimming intervals near anaerobic threshold, and strength work, such as no kick swimming, and/or paddle work. The final set wraps everything together and gives a great sense of an athlete’s overall swim progress throughout the race season. This set is also an excellent predictor of Ironman swim performance. The athlete should record their average pace for all of the 100-yard repeats and the 200-yard paddle repeats. The average 100-yard pace can then be multiplied by 44 to get the athlete’s estimated Ironman swim time, with a wetsuit in open water. I hope this series of swim test sets helps you to direct and prescribe your athletes’ swim training throughout the year. By avoiding a one size fits all approach, an athlete’s specific limiter(s) can be addressed, and their swimming potential realized as time efficiently as possible. Jesse Kropelnicki is an elite/pro level triathlon coach who founded QT2 Sytsems LLC a leading provider of personal triathlon coaching. He is the triathlon coach of professional athletes Caitlin Snow, Jessie Donavan, and Pedro Gomes among others. His interests lie in coaching professional triathletes using quantitative training and nutrition protocols. Going to the 2012 Interbike show? Here's your chance to meet our fantastic staff and see our wonderful products! 2013 will see some feedback driven tweaks to our current product line and some nice new surprises. We'll be located at booth 11128. Drop by's are welcomed, but we highly encourage you to schedule an appointment by clicking here. What's Interbike you say? It is 750+ companies representing more than 1,200 brands - a one stop opportunity to connect with the entire bicycle industry, discover emerging trends and learn new business ideas. It takes place at the Sands Expo Center in Las Vegas, Nevada from Wednesday, September 19th through Friday, September 21st. Stop by our Interbike booth to discover why our new Helix wetsuit is the world's fastest and most comfortable wetsuit. Ross Davenport and David Carry have both completed an Olympic hat trick after competing in London, their third Games. Ross and David, who both chose to race in blueseventy, produced outstanding performances to reach Olympic finals in Britain’s greatest Games since 1908. London was your 3rd Olympics, congratulations! What will be your lasting memory from the Games? What was your favourite thing about being at a home Games? If you had the chance to re-live one Olympics out of Athens, Beijing and London, which would you choose and why? If you could win an Olympic gold in any sporting event other than swimming, which event would you chose and why? Why did you choose blueseventy to race in at London? So other than wearing blueseventy (of course! ), do you have any top tips for any swimmers wanting to follow in your footsteps? So who inspired you when you were young? You’ve had a great career, are you considering hanging up the nero’s now, and if so what’s next for you on dry land? How did you propose to your girlfriends? How romantic! Have you had much of a say in the wedding plans?! Finally, what has been your most defining moment during your career that you will always remember? Well thank you for your time, good luck for your weddings and for your Zambia bike ride Ross! If you would like to sponsor Ross and his team on their charity bike ride, you can make a donation at http://www.justgiving.com/zambiacycle.